We are opening this blog for first time to show everything about our leather and pyrography art (you can read more about us in our depiction). We choose a medium bracer to begin, with this funny design with animals that we found surfing the web. 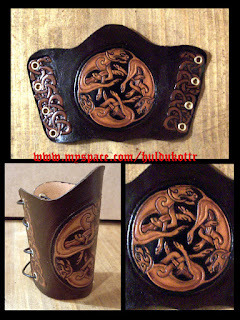 The snakes on the bracer sides are self-designed. Animals are quite common in germanic or celtic art, same as the best known knots, therefore you will find many animals in our work, as you will see in future posts.